This page has been created to provide readers with access to the various pieces of correspondence exchanged relating to the ongoing saga of the massacre of what must be thousands if not millions of birds as they undergo migration. At the moment the focus is on the Maltese hunters, but it is also practiced in other European countries. If readers wonder why migration and Malta should feature on our website or blog then spare a thought for the Nightjar as it was released on Packham’s Video Diary No 7. The series of correspondence provided here and starting at the bottom of the page includes the original letter sent to all six Yorkshire & Humber MEPs via the ‘Write to Them’ website. Wednesday 14 May 2014, we have now received a reply from the Maltese High Commission, see below for our correspondence and then the reply from their First Secretary Clint Borg, it is difficult to see how First Secretary Borg believes he has provided either a meaningful reply or the information requested? Thank you for your email on spring hunting in Malta. We are grateful for your interest and concerns on the subject, and your comments were passed on to the relevant authorities. It is to be pointed out that certain types of hunting in Malta are legal and in accordance with parameters set out by the EU. Rest assured however that the Maltese authorities are committed to eradicating any occurrences of irregular hunting / poaching and enforcing the relevant laws through a special branch of the Police Force. Please do feel free to contact me for any further information. First Secretary, Malta High Commission, 36-38 Piccaddily, London, W1J 0LE. The correspondence below is that which the reply above relates to. I am writing to express serious concern, and indeed abhorrence about the Maltese Government’s continued contravention of the European Wild Birds Directive which expressly forbids any hunting in the spring season. We would appreciate you forwarding this email and its contents on to the Maltese Parliamentary Secretary for Agriculture, Fisheries and Animal Rights Roderick Galdes. 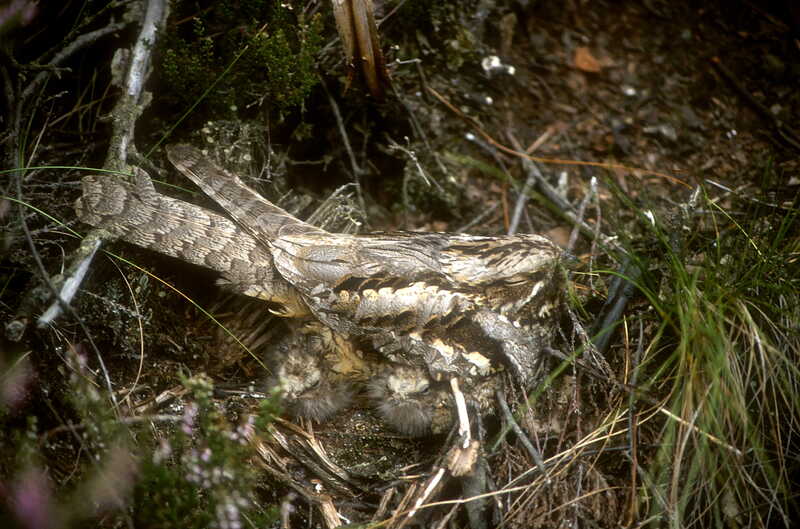 I was prompted to respond to the campaign call when I observed a Nightjar being released on the Packham Video Diaries from Malta, quite simply it could have been one of ‘our locally bred birds’! Put plainly it is a protected species so what right have your hunters got to shoot it? Each spring the Maltese Government ‘legalise’ a period of hunting to permit the shooting of migrating Quail and Turtle Doves – both species are in serious decline all over Europe. Malta is the only EU country with any derogation, we fail to understand any necessity? The Turtle Doves and Quail that are shot are those en route to the UK where declines are between 85 and 95% over the last twenty five years. Hundreds of thousands are killed in Malta each spring. This barbaric practice has no place in modern day society. Hunters appear to have influence, they even had the public moved on preventing their quiet enjoyment of public land in order that they can engage in their ‘sport’. Unfortunately the eleven thousand Maltese hunters shoot many more species, including many legally protected rarities such as Cuckoos, Herons, Warblers, Swallows and many endangered birds of prey. These birds are used merely as ‘target practice’ or are collected for taxidermy. If the spring hunting were terminated it would be far easier to police this criminal activity. We have been unable to locate any meaningful data which demonstrates genuine and sincere compliance. If the Maltese Government wishes to be part of the European Community and it is we note a net beneficiary of funds then we would like to know why the Maltese Government has failed to act against illegal activity in clear contravention of the European Wild Birds Directive ? I have read correspondence which suggests that the Maltese Government does take compliance seriously and it regards the potential fines of up to 15,000 Euro and imprisonment as being sufficient to ensure compliance. Can I therefore ask how much revenue has been received in fines since let’s say 2009? Likewise how many licenses have been revocated and people imprisoned in the same period? This information will help illustrate the level of commitment Malta demonstrates and we would be pleased to receive it (if a particular proforma is required to obtain through a Freedom of Information request then please forward) at your earliest opportunity. Thank you for taking the time to read this, I await your reply and that of Mr Galdes at your earliest opportunity along with the data requested. PS For a more graphic explanation and demonstration of activities in Malta, please see http://www.chrispackham.co.uk/ See also http://markavery.info/blog/ and https://thmcf.wordpress.com/ all sites where we would really like to able to report that you are taking action to stop this barbaric sport and breach of legislation. Thank you for your email regarding the large-scale illegal shooting of migratory birds by hunters in Malta. Mr Brons has asked me to reply to you on his behalf. As you quite rightly point out, the Birds Directive (2009/147EC) created a comprehensive scheme of protection for all wild bird species naturally occurring in the Union. The Directive was adopted unanimously by the Member States in 1979 as a response to increasing concern about the declines in Europe’s wild bird populations resulting from pollution, loss of habitats as well as unsustainable use. It was also in recognition that wild birds, many of which are migratory, are a shared heritage of the Member States and that their effective conservation required international co-operation. Malta is the only EU country to have been granted a derogation from the Birds Directive, which allows them to have a recreational spring hunting season for Turtle Dove and Common Quail. There is significant evidence confirming, however, that this derogation is not being effectively controlled by the Maltese authorities and the illegal hunting of other protected wild birds is commonplace. Wild bird populations are a shared precious resource and rare species must be protected. The Maltese Government’s failure to comply with the law is unacceptable; as is the European Union’s failure to enforce compliance. Please be assured that Andrew Brons will support EU action to ensure that the large number of wild birds that use Malta during their migration are protected in reality as well as rhetoric. To date three email replies have been received back from Rebecca Taylor, Timothy Kirkhope (with two attachments) and Edward McMillan-Scott, a letter and an enclosure were received from Linda McAvan. To date, nothing has been received from either Godfrey Bloom or Andrew Brons. Edward McMillan-Scott response to follow up email/letter (below this) 29 April 2014. Thank you for your email regarding the hunting and trapping of migrating birds in Malta. The EU’s Birds Directive 2009 bans activities which directly threaten wild bird species, including the deliberate killing or capture of birds. In 2008 the European Court of Justice ordered the Maltese Government to limit spring hunting and ruled that bird trapping should be banned too. It is however worrying that birds continue to be cruelly trapped and killed on Malta despite the activity supposedly being restricted. I and my Liberal Democrat colleagues take the protection of wild birds very seriously, whether the problem is in the UK or elsewhere in the world. My colleague Fiona Hall, Lib Dem MEP for the North East region, recently wrote to the Maltese Department for Sustainable Development, the Environment and Climate Change. However, groups such as the RSPB and Birdlife Malta have a much less positive view of Malta’s adherence to the requirements of the Directive, and both stress that a lot of work is still required to put pressure on the Maltese Government to help conserve migrants and breeding birds, and ensure that the EU rules regarding birds are fully implemented. On 8th April, George Lyon MEP (Scotland) wrote to the European Commission on behalf of Lib Dem MEPs to enquire as to whether any further action is being taken on this issue, and we are currently awaiting a reply from the responsible department. I look forward to reading the Commission’s response and will let you know of any further developments. Thank you again for raising this issue with me and please be assured that the illegal trapping of birds in Malta is of great concern to me. I wrote to you recently about the ongoing massacre of immeasurable volumes of birds by Maltese hunters. Malta is a member of the EU. You are a Vice President of the European Parliament, you are my representative in that arena. Can I please ask you to make strong representations to ensure that the Maltese Goverment complies with EU legislation, namely the Birds Directive. I don’t know if you have watched Chris Packham’s video diaries, but I would recommend you do so. See http://www.chrispackham.co.uk/ I think that they actually provide a balanced view and what is heartening in them is that the Maltese people themselves do not want the carnage, they are forced off public land by these arrogant hunters who seem to be assisted by the Police. The replies I have seen so far from the Maltese authorities (Roderick Galdes in reply to Julie Girling MEP) appears at some considerable variance from the Packham Diaries. If Roderick Galdes is so assured of Malta’s compliance then perhaps we might learn why it was Bird Life Malta member of staff who was arrested and not the hunter, was Packham treated likewise because he dared to film his experience which did not paint a favourable image of either the hunters or sadly, the Maltese Police? Does such a document as a compliance register exist, where the public can examine the ‘envisaged penalties for infringements’ Galdes writes about? 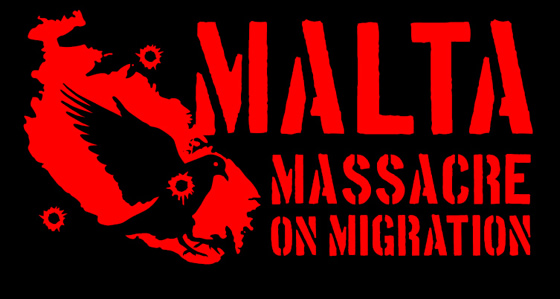 Additional coverage of the Malta Massacre on Migration can also be found on Mark Avery’s well read blog via http://markavery.info/2014/04/29/letter-battle-spring-migrant-massacre-malta/#comments and that of Thorne & Hatfield Moors Conservation Forum’s via https://thmcf.wordpress.com/2014/04/24/moor-on-malta-massacre-on-migration/ and many others as the campaign gains momentum. If the Maltese Government fail to comply with EU legislation then should their membership be reviewed? Can we be assured of your willingness to take a proactive stance on this atrocity please? Thank you for your email concerning the illegal hunting of birds in Malta. This is an issue we have been aware of for quite some time, and my colleague Julie Girling MEP, who represents The UK Conservatives in the European Parliament on Animal Welfare matters, has been in contact with the Maltese Ministry and the Commissioner for the Environment, Commissioner Potocnik. Mrs Girling recently spoke to the Commissioner alongside Birdlife and like-minded MEPs about this issue and was reassured that the Commission has a close and continued dialogue with Malta. As a result Malta has agreed to monitor the autumn hunt closely. They are doing so in an effort to address the situation regarding the use of permits under the derogation, in other words the number of birds shot. Following on from this meeting, the Commissioner has agreed to ask Malta for details of their independent monitoring and have asked permission for officials to be present during such time. Please find below a number of parliamentary questions and responses addressed to Commissioner Potocnik which have been submitted in recent months. 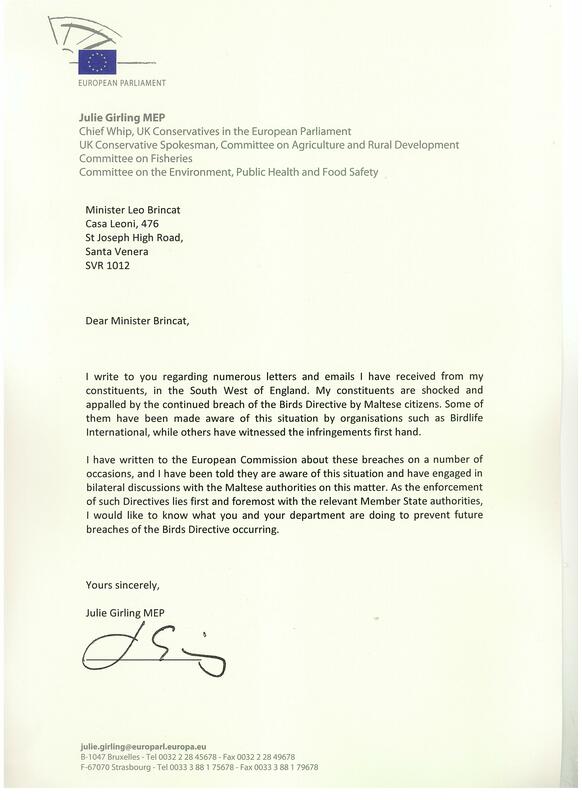 Please also find attached a copy of Mrs Girling’s letter to the Maltese Ministry, and their subsequent response. Commissioner Potocnik gave an answer to Mr. Zanoni’s question E-004289-13 on “Spring quail and turtle dove hunting in Malta and new and repeated infringements of Directive 147/2009/EC (Birds Directive)”. This answer stated the Commission would carefully analyse the detailed derogation report submitted by the Maltese Government, alongside any other reports submitted by relevant stakeholders, to see whether the derogation was applied in line with the strict conditions of the EU’s Birds Directive. Has this analysis already been completed by the Commission? If so, what was the Commission’s interpretation? Has any further enforcement action resulted from this analysis? The Commission has completed its assessment of the various reports received from the Maltese government and interested stakeholders, including local hunting associations and bird conservation organisations. The results of this assessment showed conflicting views and explanations as regards the outcome of the 2013 spring hunting derogation in Malta and particularly the enforcement measures undertaken. Therefore the Commission sought further information and clarification on the matter from the Maltese authorities during an annual bilateral environmental package meeting held in November 2013. The Commission is working with Malta to find solutions to existing shortcomings and gaps in the country’s application of spring hunting derogations and to identify ways to further improve the spring hunting derogation regime and strengthen enforcement. This process is not yet concluded. The association BirdLife Malta recently reported(1) that the Maltese authorities have approved regulations,(2) by way of derogation from Article 9 of the Birds Directive,(3) permitting the hunting of a total of 5 000 common quail (Coturnix coturnix) and 11 000 turtle doves (Streptopelia turtur) across the island between 10 April 2013 and 30 April 2013. The derogation has been granted to all 9 487 licensed hunters; the bag limit for each hunter is two birds a day and four throughout the spring season. This will therefore equate to an average of 0.5 quail and 1.1 turtle doves for every Maltese hunter during the spring hunting season. In both cases, each hunter will easily be able to reach the bag limit as soon as hunting begins, in the early hours of 10 April. Clearly, the regulation does not meet the conditions laid down in Article 9(1) and (2) of the directive and, in particular, the strict controls requested will not be carried out, because the Maltese regulation provides for only 7 agents per 1 000 hunters. Furthermore, the ALE unit (4) responsible for performing the hunting controls has only 18 units, which are supplemented by a few local police units during the hunting season. This figure therefore falls short of the 66 units in total stipulated by the regulation. Consequently, the total bag limits laid down are inaccurate since they will not be guaranteed by any strict controls. It is logical to assume that the actual bag limit will exceed that stipulated by various orders of magnitude. Can the Commission urgently intervene so that extraordinary action is taken in response to the new infringement, through the launch of a special suspension procedure, via the Court of Justice of the European Union, pursuant to Articles 83 and 84 of the Court’s Rules of Procedure? Can the Commission launch, under Article 260 TFEU and in accordance with the criteria in Commission communication (SEC(2005)1658), the procedure by which the Court of Justice of the European Union may rule that the Republic of Malta has failed to take the measures required in order to comply with the Court’s judgment, so that the Court sets the amount of a lump sum or penalty payment that is appropriate in the circumstances? (1) BirdLife Malta press releases from 9 April 2013, 13 April 2013 and 15 April 2013: http://www.birdlifemalta.org/media/press/hunting/. (2) L.N. 122 and 123 of 2013 published in the supplement to Malta Government Gazette No 19.062 of 28 March 2013. (3) Directive 147/2009/EC. (4) Administrative Law Enforcement. Answer – 4.6.2013: The Court’s judgment(1) held that Malta had disproportionately permitted spring hunting between 2004 and 2007. However the judgment left open the possibility of a limited spring hunting derogation of Turtle Dove and Quail under strictly supervised conditions in view of the specific circumstances prevalent in Malta. The measures related to a limited spring hunting season are provided for in the relevant national regulations (2) which appear to take properly into consideration the principle of proportionality invoked by the Court. The letters referred to above can be accessed below (click on image to enlarge) and the Reply to Ms Julie Girling MEP by clicking on the link. As you mention in your email, the EU’s Birds Directive 2009 bans activities which directly threaten wild bird species, including the deliberate killing or capture of birds. In 2008 the European Court of Justice ordered the Maltese Government to limit spring hunting and ruled that bird trapping should be banned too. I am writing to express my concern, and indeed my abhorrence about the Maltese Government’s continued contravention of the European Wild Birds Directive which expressly forbids any hunting in the spring season. Each spring the Maltese Government ‘legalise’ a period of hunting to permit the shooting of migrating Quail and Turtle Doves – both species are in serious decline all over Europe. The Turtle Doves and Quail that are shot are those en route to the UK where declines are between 85 and 95% over the last twenty five years. Hundreds of thousands are killed in Malta each spring. This barbaric practice has no place in modern day society. Hunters appear to have influence, they even had the public moved on preventing their quiet enjoyment of public land in order that they can engage in their ‘sport’. Unfortunately the eleven thousand Maltese hunters shoot many more species, including many legally protected rarities such as Cuckoos, Herons, Warblers, Swallows and many endangered birds of prey. These birds are used merely as ‘target practice’ or are collected for taxidermy. If the spring hunting were terminated it would be far easier to police this criminal activity. The European Commission is aware of this practice. It is regularly lobbied by Birdlife Malta, other conservation bodies and concerned individuals but has taken no action, nor exerted any pressure on the Maltese government since 2009. I would like to know why the EC has failed to act? I would appreciate it if you would investigate why the EC fails to act and provide me with a simple straightforward answer. I would also appreciate you raising this issue with the necessary fortitude, in the most appropriate arena, at the earliest opportunity and campaign on my behalf to see that the European Parliament honours its commitment to protect our birds and wildlife and it is not complacent or selective in enforcement and legislative compliance. Please, can we collectively ensure that this 2014 spring hunting season on Malta is to be the very last. I also intend writing to the Maltese High Commission but I understand that they deem their actions as exemplar in terms of legislative compliance, perhaps you could all be encouraged to contact them as well? Thank you for taking the time to read this, I await your reply at your earliest opportunity.